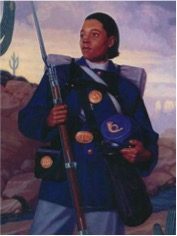 Cathay Williams is history’s only known female Buffalo Soldier, according to the National Park Service. In 1866, she enlisted in the United States Army under the pseudonym “William Cathay,” becoming the first known black woman to enlist in the Army and the only documented African-American woman to serve as a soldier in the 19th century. Born into enslavement in Independence, Missouri, in 1844, Williams labored in the plantation home of a wealthy farmer named William Johnson. Following the farmer’s death, the Civil War commenced. Thereafter, Union forces occupied Jefferson City—in which the plantation was located—capturing the enslaved as “contraband” and forcing them to work as military support. At the age of 17, Williams worked as a cook and washerwoman for the Federal Army. While accompanying the officers, she witnessed a number of historic events, including the Battle of Pea Ridge, the Red River Campaign and the Shenandoah Valley raids, according to blackpast.org. Once the war ended, Williams enlisted in the Army, despite a law banning women from joining the military. Williams disguised herself as a male and enlisted in the 38th U.S. Infantry, Company A—a newly-formed all-black U.S. Army Regiment, according to the U.S. Army. The African-American soldiers came to be known as Buffalo Soldiers. At the time, the Army did not require full medical examinations. This allowed Williams to be processed without her gender being revealed. During her enlistment, Williams experienced frequent health issues. After a case of smallpox, her body began to show strain. The post surgeon eventually discovered that she was a woman and informed the commander. This marked the end of her tenure with the Army. In 1868, she was honorably discharged after serving two years of her three-year engagement.